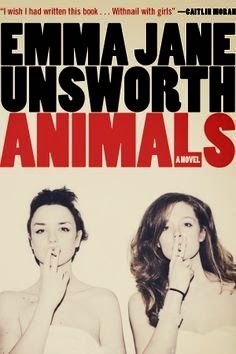 (by Emma Jane Unsworth) is not for everyone, and it is definitely not for the faint of heart. (Mom – you’re not going to like this book…..) Honestly, I am not even sure how much I like it. I mean I do like it, I really like it actually… but it’s kind of terrifying. It’s like someone took my early 20s and put them on crack and ecstasy and then flipped it all around til all I want to do is vomit. And that’s literally what is happening in this book – with all of the drugs and all of the vomiting. A lot. Like over and over again. But still. I do like it. Tyler and Laura are both girls in their late 20s/early 30s living together in Manchester, who haven’t really gotten it all figured out just yet. Instead of trying, they get drunk a lot (like every day) do a ton of drugs and then just lay about hungover the rest of the time. I think that occasionally they may go to their dead-end jobs. But everything is not as cheery as it seems on the surface. Laura is engaged to be married and her fiancé, Jim, has recently quit alcohol and she is also trying to write a novel, Bacon, about a priest falling in love with a talking pig. Tyler is having some separation anxiety and is trying to get Laura in to some crazier and crazier situations. Laura describes her friendship with Tyler as “kinship, or une affinité profonde; that doppelganger effect that can go either way: to mutual understanding or mutual destruction. Someone sees right to your backbone and simultaneously feels their backbone acknowledged” It sounds beautiful, right? Too bad Tyler is the queen bee of hot messes. She is constantly drunk or high or hungover, she is loud and crass and has no problem yelling at anyone to get what she wants, or just for the fun of it; oh and then there is the vomiting in public. Laura is almost as bad. Now to be fair we are being told the story from Laura’s point of view, but she seems to be a little more aware that maybe things have gotten out of control. The problem is, when Tyler says jump Laura says how high (heh… see what I did there…) and so all of Laura’s good intentions go running out the door. The thing is, as dirty and raunchy as this book is, it is really good. It is really well written, it’s poignant and relevant and Unsworth does a brilliant job of showing the complexities of relationships and the pain of feeling like you are losing your best friend. She also has done a brilliant job with Laura’s character. While I am pretty sure Laura is a reliable narrator, she’s not necessarily a reliable person. She talks a lot about being a kid and trying to fit in, even if it meant pretending to be a different religion depending on that of her current friends. She talks about how she felt so much internal pressure that she would throw up and had to go see a therapist. I don’t really care for Tyler that much, but I can see how Laura would be totally taken in with her. Tyler is beautiful and charismatic, and doesn’t really give you the opportunity to say no. She’s one of those girls, who even though you aren’t sure that you really like them, you really want to be in their orbit. That’s kind of the situation here; when the story first started Tyler and Laura were soulmates, but as Laura continues the narrative we can start to see the chinks in the armour. Laura is caught between two worlds – the sensational Tyler and calm and collected Jim. Jim is stable and responsible and he really wants to settle down but his job keeps him overseas a lot, out of sight out of mind. Luckily, and most importantly Laura is head over heels for him but the distance is hard on her. “Jim. I missed him in a physical way, like a thirst. Missed his mouth and his composure and his steady loving eyes. I didn’t buy the whole ‘absence makes the heart grow fonder’ spiel. I was with Rochester on the matter: a cord was tied to my ribcage on one end and tied at the other end to Jim’s, and the further away he got, the thinner the cord stretched” I totally relate to Laura, besides the extreme drinking and drugs of course. When you don’t have a lot of confidence in yourself it’s so easy to get swept up with someone who makes you feel like you are part of something huge. Laura is starting to get pressure from Jim to tone things down a little though, and the stress of living in two worlds is starting to wear on her. Besides dealing with all of this, her father is dying from cancer and Laura has no idea how to deal. She’s starting to come apart at the seams, and I don’t think that it’s going to end very well. Jim is the only one who keeps her even semi stable “What was it he said to me the other day? We are not defined by how we are but by how we try to be. What if you try too hard to be everything? I countered. Lie down, he said. Lie still”. But Jim is gone a lot and things just keep escalating and I am slightly worried that Laura is going to end up dead or in jail. Unsworth has definitely taken the traditional perceptions and roles of females and thrown them out the window. Women in their early 30s are supposed to be ready to settle down, get married, have babies and live in single family homes in the suburbs; and of course, if that’s what they want than all the power to them. But being pigeon holed like that doesn’t work for everyone, some woman are not ready to settle down, some women will never want babies or husbands or houses; being a woman in my early 30s without these things I can commiserate. I am constantly being asked when my boyfriend and I are going to get married and have babies. It’s incredibly refreshing to read a story where women are going through the same things and are pushing back. I’m not sure that it’s necessary to go as far as she does with it, but it’s interesting seeing girls behave in ways that we traditionally assign to boys. And since I am only half way through, although I’m worried about Laura, I really don’t know where this story will go. I guess it’s also the way to get your point across – go big or go home, right? I think the most appropriate tea for this book is just a traditional green tea - like Dragonwell from David's. Something to sooth the stomach perhaps, after a long night of whisky and cocaine?